The Virginia Herpetological Society (VHS) is an organization dedicated to bringing together people interested in advancing their knowledge of Virginia’s reptiles and amphibians. The VHS educates on identification, conservation, captive care, and other services and publishes its findings in a bulletin twice a year. Their website contains information on Virginia reptiles and amphibians including include pictures, distribution maps, and other useful resources. 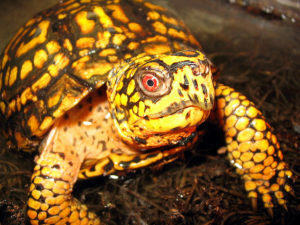 I was surprised to discover the Woodland Box Turtle (the most common turtle in Virginia) was listed as a Virginia Wildlife Action Plan Rating Tier III, defined as having High Conservation Need with extinction or extirpation possible. This turtle is common but is facing a decline in population due to motor vehicle collisions and habitat fragmentation. Because of this, the VHS has a link on their home page in which anyone can report a sighting of this turtle, in order to analyze population distribution trends. Sophomore at James Madison University. FOR Intern this summer focused on documenting reptiles and amphibians around FOR’s campus in partnership with the Virginia Herpetological Society.